My spin. A Canadian working for an American company in China. I finally found the world's smallest statue of the world's largest monster somewhere hidden near Hibaya park in central Tokyo, where the Toho Studios were. Coincidentally a helicopter was buzzing non-stop overhead because Obama was in town, presumably to discuss caging in the newest monster threat, China. A few Japanese language classes have empowered me to properly ask directions to Godzilla. I was quickly pointed to the small big guy. If you like beer and talking to fascinating strangers, then your bar heaven would be Shinjuku Golden Gai. Originally WWII era brothels, now all have been converted into what is likely the world's densest concentration of tiny bars--a critical mass so to speak; more of that later--most of which can only fit in about a dozen people including the bartender. I would have invited Godzilla, but he's a bad drunk, stumbling about whilst flailing his arms. A parallel plot of the original movies could be that he tends to get trashed, wake up in the ocean, blindly stumble ashore and then gets rather pissed with the Japanese Self-Defense Forces preventing him from further entanglement in Japan's electrical and rail infrastructure. 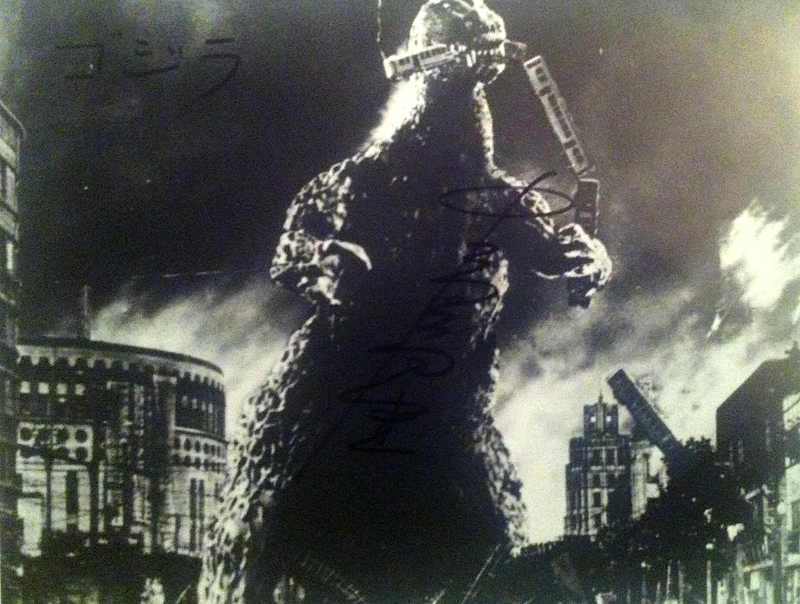 Below are signed photos I bought a while back; the first is signed by the man inside the original Godzilla suit, Haruo Nakajima. 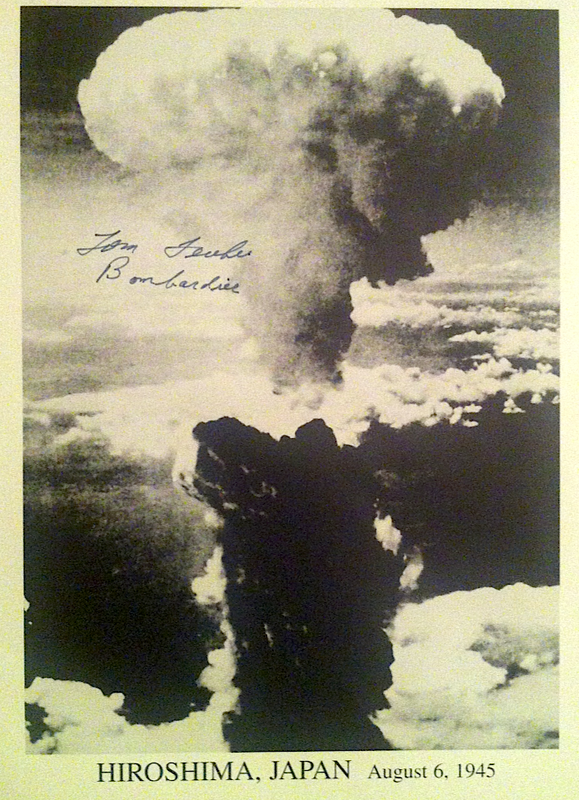 The second is of the Hiroshima mushroom cloud, signed by Tom Ferebee, the Enola Gay bombardier, as if it was his "work". I have written a bit here about the connection between Godzilla and Japan's victimization from nuclear weapons. Essentially during the decade of America's occupation of Japan, censorship was so tight that one couldn't even discuss censorship. So as to feed the universal appetite for war movies, without showing Japanese troops fighting other nations--which obviously would have been too controversial--Toho Studios released a movie in 1954 about defending Japan against a non-human threat; one that in fact had been created or awoken from the very nuclear weapons that had terrorized Japan at the end of the war. In Golden Gai last week I had a great conversation with a correspondent from one of Japan's top current affairs magazines regarding Godzilla and Hiroshima and showed him these photos. He himself has seen the horrors of war in Iraq and Afghanistan, and just two weeks ago met the Dalai Lama (speaking of monsters--he is the figurehead of Tibetan theocratic feudal serfdom that was disbanded in the 1950s by other monsters). The journalist agreed that Godzilla was created, both literally--at least in the mythology--and figuratively--in the movie franchise--from the nuclear detonations during the "Pacific War." Let's hope they don't blow up this next Godzilla reboot.